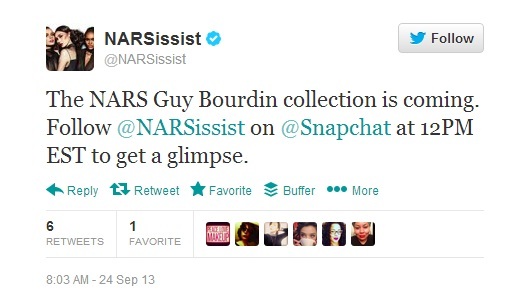 Call it the ultimate teaser – cosmetics company NARS recently turned to Snapchat to release a preview of its upcoming Guy Bourdin color cosmetics collection. Snapchat, an app where you can share a photo or video in increments of anywhere from one to ten seconds, allows users to send exclusive content to its followers. The catch? 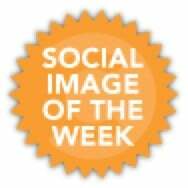 Once the photo or video is viewed for the set time duration, it disappears and cannot be viewed again. To promote the exclusive Snapchat preview, the company spread the news via its @NARSissist Twitter and Instagram account. Only individuals who added NARSissist as a friend on Snapchat before 12:00 p.m. EST on September 24th had access to the preview content. Although Snapchat initially generated headlines for some of the, erm, more blushworthy content early on, the app now boasts 350 million photos daily, up from 20 million one year ago. Plus, engagement on the app from brands like NARS, Taco Bell, Rebecca Minkoff, Karmaloop, and more, is worth noting and following. Having big brands on board across a variety of industries using Snapchat in unique ways indicates a continued, if not growing, interest in the app. Delve deeper into the user experience of Snapchat and you’ll see why. Content is fairly quick and easy to produce, but must be filmed or shot in the moment, versus uploaded from a camera roll. There is no “select all” option to send one message to your Snapchat friends instantly, meaning that each recipient needs to be checked individually. This means that the platform best lends itself to brands who value and are willing to invest in one-to-one or small group sharing of Snapchats. However, with content self-destructing in 10 seconds or less, it may be hard to keep track of all the interactions with a particular user. Feedback on the NARS exclusive preview was largely positive, predominately for the company’s interest in trying something new to generate buzz around a new product launch. The biggest debate seemed to be around the length of the video. 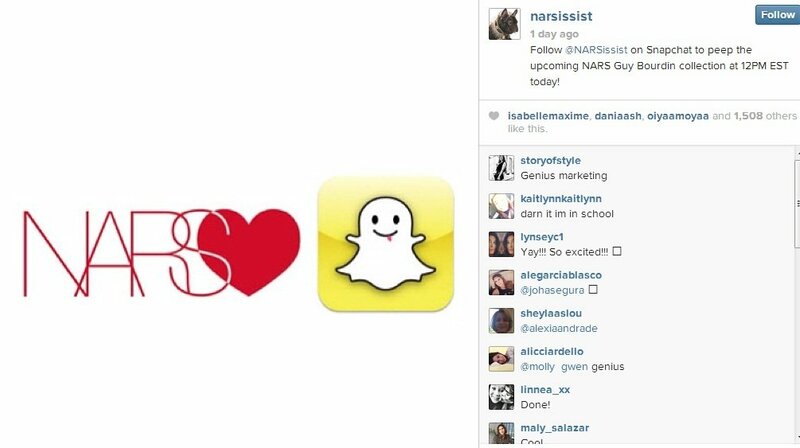 While one fan tweeted, “The @NARSissist Snapchat reveal was amazing. Best 3 seconds of the day,” others lamented that they couldn’t get a strong sense of the collection in only a few seconds. The lack of screen shots readily available online supports that the content may have been too brief to allow influencers to further “leak” a Snapchat screen shot from the preview, which actually could have been a strategic way to further generate buzz. In general, the campaign and subsequent response reinforced Snapchat as a tool for brands to consider. Research how brands are currently using Snapchat and you’ll find that not many have leveraged the app in a meaningful way. There’s plenty of opportunity to be creative and show fans that you appreciate them with a photo or video. Similar to how a response on Facebook or Twitter can make a fan’s day, imagine what sending a personalized Snapchat could do to make them smile, or thank them for their loyalty. The Guy Bourdin color cosmetics collection from NARS will officially debut on October 15. No word yet on what the company’s next Snapchat will be, but this writer will definitely be watching. What do you think of Snapchat? Do you see potential for companies to use Snapchat?